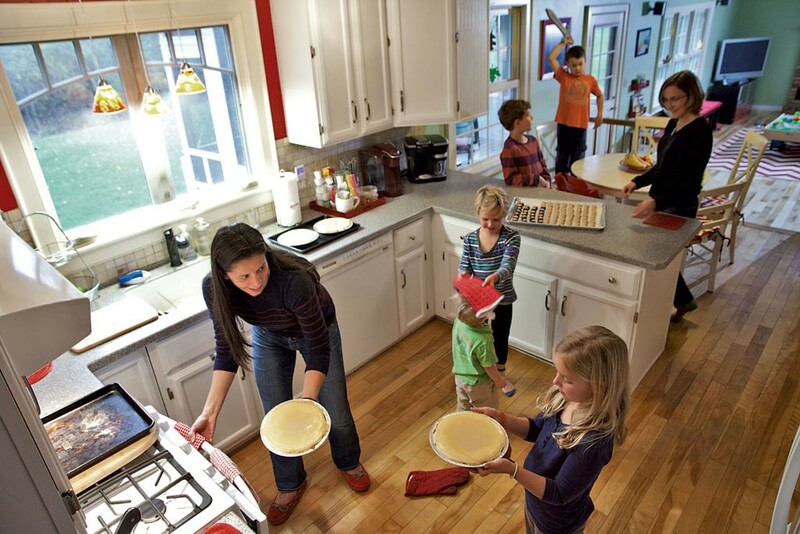 Home Bakery | Habitat | Kids VT - small people, big ideas! Juanita Galloway in her kitchen with business partner Anne Marcoe and their five kids, (bottom to top) Claire Marcoe, Theo Galloway, Georgia Marcoe, Henry Marcoe and Henry Galloway. Think it's hard to keep your kitchen tidy? Try running a baked-goods business out of it. Shelburne friends Juanita Galloway and Anne Marcoe own Good Comida, a home bakery specializing in Colombian-style cheesecake and chocolate-dipped confections made with locally sourced ingredients. They have five kids, ages 2 to 10, between them. Two to three days a week, while the older children are in school, and Galloway's 2-year-old son, Theo, is playing or napping, the pair bakes and tests recipes — including a light and silky cheesecake that Galloway's mom used to bake in Bogotá and Marcoe's chocolate-dipped peanut-butter-ball "buckeyes" — in Galloway's home-bakery-certified kitchen. They deliver their delicacies to Healthy Living Market & Café, City Market and Shelburne Supermarket. When the kids get home from school, Galloway and Marcoe transfer the cooling cakes — usually 12 to 14 each week — from the kitchen counter into the refrigerator and transition back to mom mode. Establishing boundaries between family and work can be challenging, the women agree. "It's really hard to turn off our brains," Galloway says. Strategizing via text message in the evenings and bookkeeping on Sundays when the husbands can watch the kids allow Good Comida to keep on cooking even when school's out. But taste testing is a family affair, to the delight of Galloway's 6-year-old son. "Every single day when Henry gets home," she said, "he asks if there's cheesecake for dessert." Good Comida is one of 181 licensed home bakeries in the state, according to the Vermont Department of Health. In preparation for a required visit from a food inspector, Galloway says, "I literally spent the entire month cleaning my kitchen from top to bottom." In the early months of the business, Galloway used her kitchen fridge to store cakes and perishable ingredients. When it became overcrowded, she bought a second fridge solely for Good Comida, which she keeps in the garage. She stores nonperishable ingredients in large tubs in the kitchen pantry. Galloway and Marcoe use regular-size KitchenAid mixers and food processors to prep ingredients. By law, home bakeries are not allowed to have industrial equipment.